With full custom design and manufacturing capabilities, we have the flexibility to develop a product or system to meet the exact requirements of a customer’s needs and specification. We can provide best in class designs for AC/DC or DC/DC power solutions from around 20W to 20kW. Input Voltage : Equipment can operate from a range of AC and DC Input voltages depending on where it is deployed. Equipment installed in military, tactical and non-tactical vehicles will often need to meet the operating characteristics for 28Vin systems which are defined in standards such as UK MOD Def-Stan 61-5 , US DOD MIL-STD 1275 and other national standards. Environment: Military equipment needs to survive in harsher conditions than other electronics for example higher levels of shock, vibration, wider temperature ranges, exposure to corrosive atmosphere, particles, salt water and numerous other challenges. Customer specific power solutions. 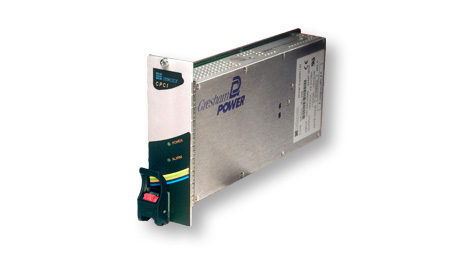 Talk to Gresham Power for custom and Value-added power solutions. We will discuss with you the best solution and submit a proposal to meet the most demanding requirements. DC Surge and Spike Suppressor for vehicle, tracked vehicle and airborne applications. DEFSTAN 61-5 part 6 issue 6 introduced some mandatory requirements for connection to 12V and 24V military platforms such as circuit protection, environmental de-rating, earthing and more. The Gresham DC load dump suppressor for military platforms, including vehicles, tracked vehicles, helicopters etc. meets the requirements of Mil-Std 1275A-E / DO-160 / DEFSTAN 61-5 part 6 issue 6 Surge Ride-Through and protects the DC power supply by removing the harmful Over Voltage surges. 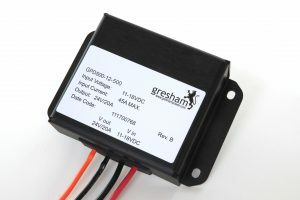 With 300W and 600W versions available the Gresham DC load dump suppressor is an ideal and reliable choice. Supplied in module format or incorporated into the design, our custom power team can provide you with the optimum solution. 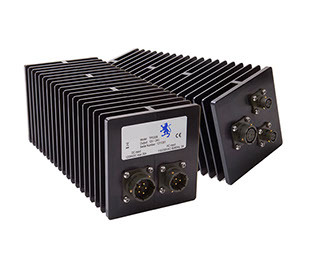 Originally designed for Battle Groups this ‘connect anywhere’ power supply can connect to any available power source, AC mains, DC vehicles or helicopter power with the frequency requirements. Made from a solid machined aluminium case this power supply can withstand the harsh treatments and environments required as a go anywhere power source. This model shown is 150W but this is fully customisable and higher power or additional outputs can be built on request. We would expect requirements for this to be unique to the application. Please contact us for details. Designed to enable equipment designed for use with 24V/28VDC military vehicle electrical systems to be deployed on platforms with a nominal 12VDC electrical system. The GPD500 500W DC-DC converter has a wide-range DC input voltage, from 10 to 20 volts, making it ideal for vehicle-mounted systems, tactical and non-tactical, fixed and mobile communications and security systems. The GPD500 delivers a steady, regulated 24VDC output at 500W which meets the requirements of MIL-STD 1275D enabling users to swiftly deploy military equipment onto the vehicle. The low-profile units have an ultra-high efficiency of typically 96% at full load and can operate over an ambient temperature range of -40° to 70°C. 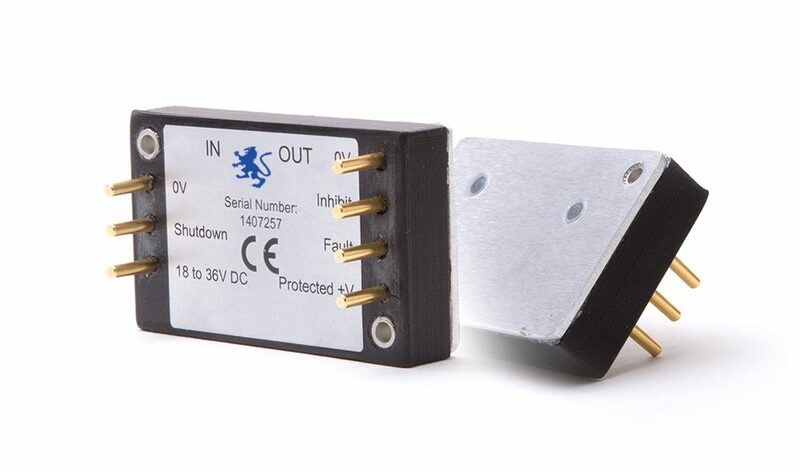 They are small-sized, high stability, long life and have a high degree of protection, making them an ideal choice for step-up, non-isolated converters for vehicle systems. Fully sealed encapsulation, IP67 protection class, withstand exposure to harsh environments. Guaranteed operation in complex environments with high reliability.